So our new columnist Alison Znamierowski is pretty darn cool (check out her introductory column here). She's a writer, artist, educator, and knows how to throw a wintertime bash without an ounce of trash. Follow her lead for making the holiday season waste free and wonderful. It’s the holiday season! Which means hot chocolate and twinkle lights and decorations and family and delicious foods, and … waste. Lots of it. As much as the holidays are about being with the people you love and brightening the grey of winter, they’re also about consumerism; about buying and receiving gifts. Which is wonderful, don’t get me wrong. I love the gifting tradition. It just means I have to get clever about how and what I’m buying. The good news is: I have found a bunch of ways to cut down on waste production during this holiday season! #1: Buy secondhand, and buy quality over quantity. These two are huge. So many resources, so much waste, and such unethical treatment usually go into the production of new consumerist goods — factory labor, environmental resources, plastics, toxic byproducts, animal slaughter, etc. So the biggest thing this holiday season is to buy secondhand. Our society perpetuates the myth that second-hand items are not as valuable as new ones, but that is not true. It is the content of the gift that matters, not whether or not it comes in a new plastic lining. Another thing is — don’t buy a ton of different items hoping that the person you’re buying for might like one of them. It feels so much better to receive one item you absolutely love than to receive a bunch of items that you don’t like, that aren’t particularly thoughtful. So think on what a person would really love, really appreciate, and get that for them. If you’re feeling squeamish about buying previously-owned items, just make sure to wash them after buying. And if you’re picturing gross, ugly sweaters and kitschy knick-knacks, think again. Second-hand stores have some really cool stuff. If you're still not convinced, locally produced goods (soaps, artwork, jewelry, candles, scarves, etc.) are also great. The adorable Sisters Soaps that are made by two sisters and their goats in Maine are one of my personal favorite options. My family has been using this trick for four years now — and it works wonderfully! My mom bought a bunch of holiday-themed fabrics at the craft store, along with festive colored string. We reuse the same fabrics, and a lot of the string, every year. They work exactly the same as wrapping paper and ribbon— just without the waste! I found this drawstring, below, from a dress that I didn’t want to use and this rucksack, and thought they would be a perfect option for wrapping something that was an irregular shape. 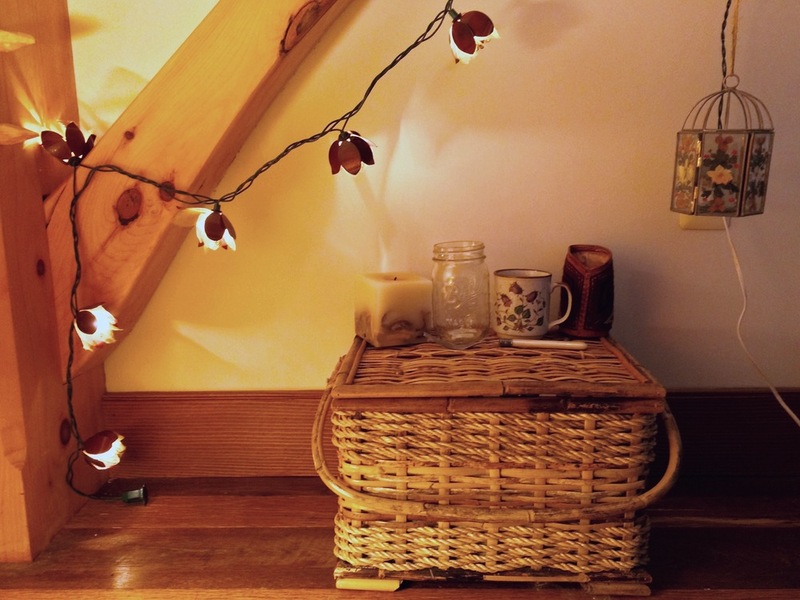 If you look around your house, there are probably a bunch of things like this that you could use for gifts for family — and keep reusing after the holidays! We don’t get the newspaper, but you could absolutely use newspaper too… or any paper, really. And: you can just put it right back in the recycling once it has been used! All multi-use, recyclable, and/or compostable wrapping. I used my 2015 lunar calendar to make cards and tags this year, but you can use a lot of different things — posters you don’t want anymore, scrap paper, newspaper. Whatever you can find, and think would make a cool card. Since I live with my parents, who are mindful about the environment but don't follow a completely zero waste lifestyle, we do produce trash. I turned mine into an ornament. I didn’t end up using the cardboard circle, but plan on using it either as a tag or a different ornament. For the ‘bulb’ part of the ornament, I essentially compressed the clear plastic bags, put them into the metallic bag, scrunched that into a ball, and used the elastics to hold the plastics together. Then I glued the clear red wrappers to the plastic ball. For the top part of the ornament, I wrapped extra gold chain from a necklace I made around the tip of the bulb, and then attached the earring to the side as a charm. I used the rest of the metal from the earring hook to create the loop at the top of the ornament. 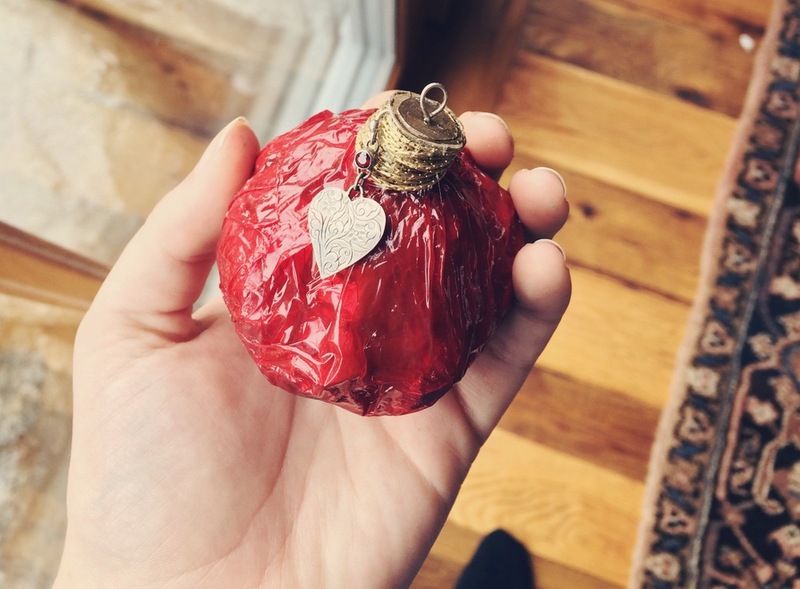 It’s not the most beautiful ornament I’ve ever seen — it’s definitely D.I.Y. — but if it’s keeping those plastics out of the landfill or the ocean, it is certainly welcome to hang on my Christmas tree.